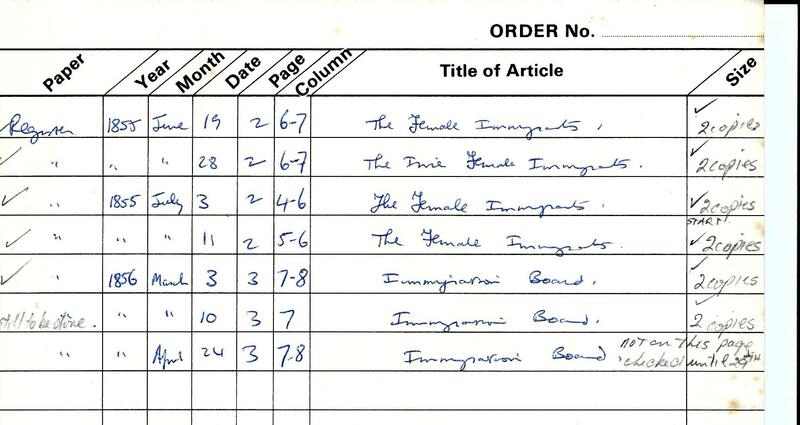 This entry was tagged Bridget Henessy, Bridget Mahoney per Elgin, Clare, Ellen Shanley, Grand Trianon, Immigrant depots, Jane Stack, Marie Steiner, Mary Jane Orr, Nashwauk, Rachel Boardman, Richard Graves McDonnell, South Australia, South Australia Excessive Female Immigration. Bookmark the permalink. 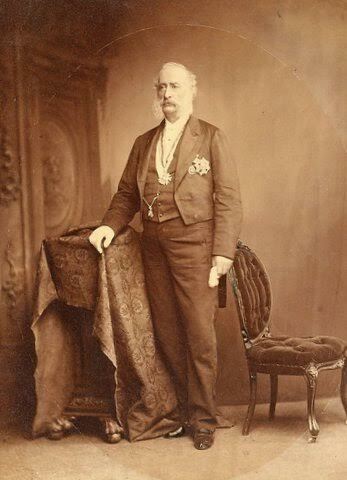 I’m researching a Margaret Sullivan who came out under The Earl Grey Scheme on the Elgin in 1849. There were at least 3 other Margaret Sullivans who arrived with her so which one she is we don’t know(different sites give a different number of Margaret Sullivans). She went on to marry Daniel Ryan(came out with his parents Thomas and Hanorah Ryan on the Birman 1840 with siblings Patrick, Julia/Johanna,James and Thomas) and owned farms in Para Plains and Saddleworth, ending their years in Port Pirie. They had children Thomas, Honorah, Daniel, James, Margaret,John and William. I know from shipping records the girls on the Elgin came from Skibbren,Killarney,Fermoy,Lismore and Clonmel workhouses. Is there any information about these workhouses. I’d love to give our Margaret Sullivan an individual identity. My great great grandmother was also on the ‘Elgin’ and came from Mitchellstown in Cork. I have never found which workhouse she came from and can only assume that it was Fermoy as it was operating in 1848-49 and was the closest to where she lived. 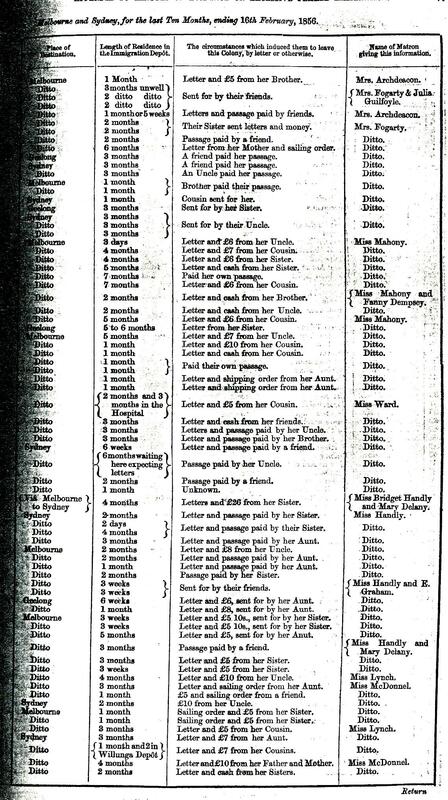 Have you records of the workhouse that the girls came from please? Sorry I haven’t anything at all. We only know our Margaret Sullivan came out on the Elgin. A family break up meant we have no family verbal stories. 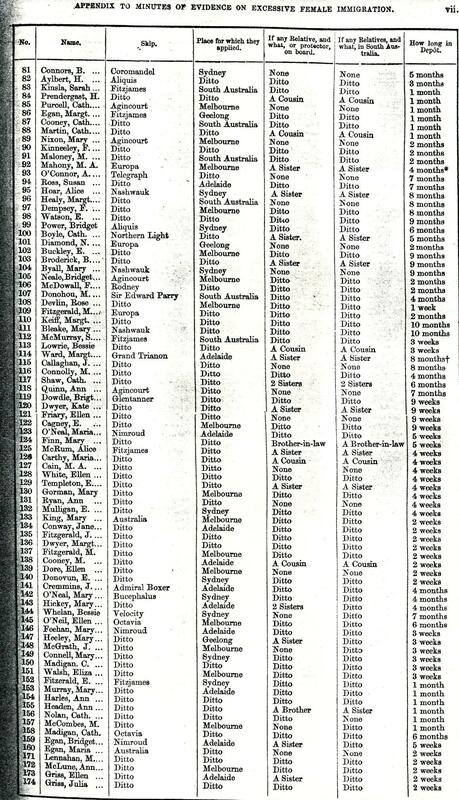 I got the name of those workhouses from the Elgin passenger lists. Johanna Shay b 1838 father Michael Oshay married a Thomas Castle in Sevenhills College near Clare SA in 1858 (both residing in Kooringa). 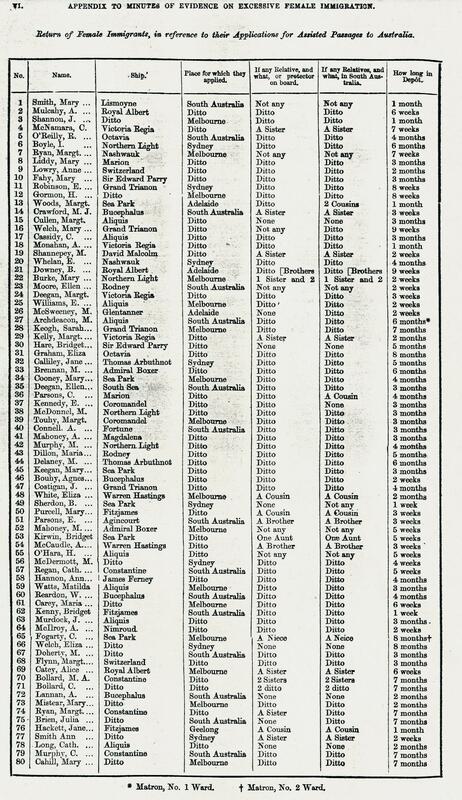 She does not appear on the list of servants sent to Clare. Her place of abode was Kooringa? 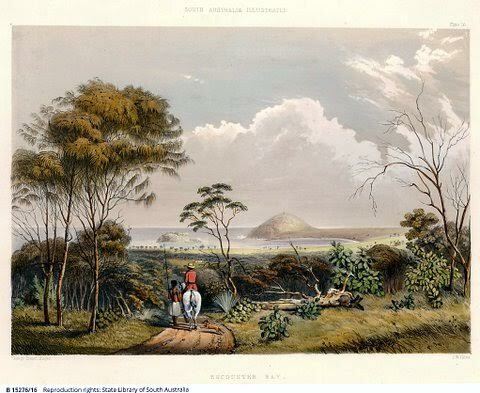 By 1859 she was in Sydney and settled in Katoomba NSW with John Bentley. A bogus name was used (due to Bentley being Protestant and Johanna Irish). I recently viewed Johanna’s intestate estate (after the required 100yr wait). This estate confirms in writing that Johanna married John Bentley under the assumed name “Thomas Castle”. Irish sense of humour perhaps? Catholics did not marry Protestants so the marriage Was arranged using a bogus name! In 1859 and settled there. Interestingly Johanna married a Thomas Castle in 1858 in Clare SA (Sevenhills) and was a resident of Kooringa at that time. Laurie Cousins writes, “I have a copy of the drawing you show as Emmiggrants landing at Glenelg 1847 courtesy Library of South Australia and hope these details may be helpful. Here is some history of two SA Irish famine girls. I have another great, great Irish grandmother named Bridget ( Biddy) COLLETON who arrived on the ‘Confiance’ Adelaide Sept 12th, 1854, age 21yrs. It has taken me a long time to find her on a shiplist as her name changed many times on marriage and birth cerificates. 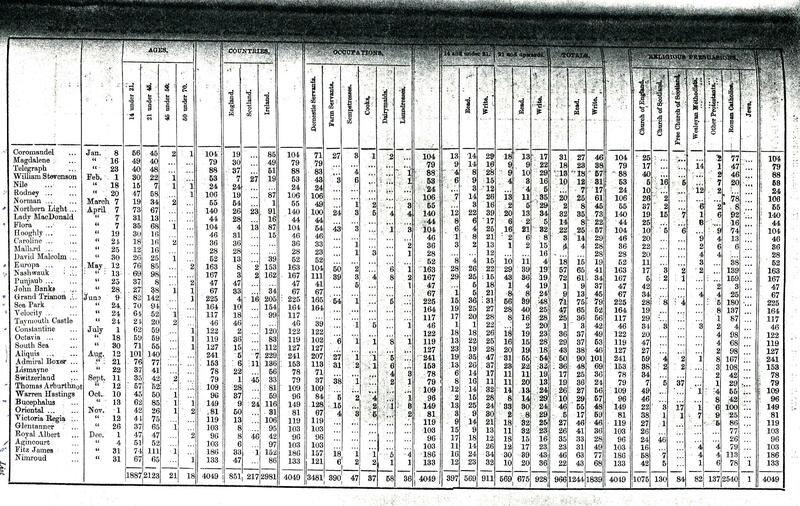 Names on birth certificates include Calussen, Collisson, Colton, Cullighan, Lotten, and Beate Colluson! 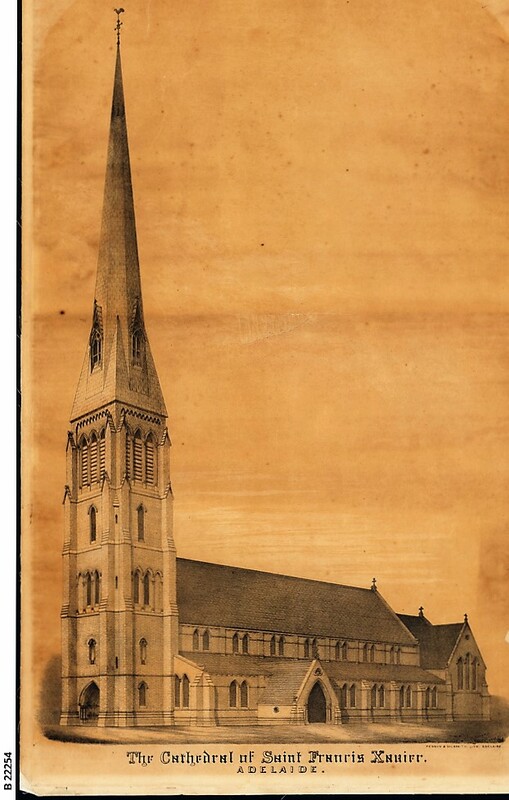 Bridget COLLINSON married Johann Traugott WEINERT at the Mount Barker Catholic Church 28.08.1856 and a witness was Anne WILLIAMS. 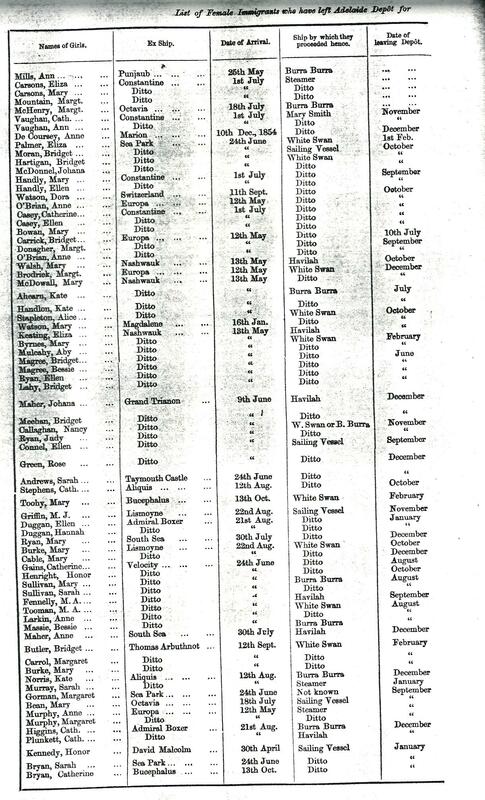 I decided to search for Anne WILLIAMS (age18) and eventually found her name adjacent to Biddy COLLETON ( age 21 yrs) on the ‘Confiance’ ship list and both were servants from Kilkenny. Johann Traugott was from a nearby German village of Lobethal. 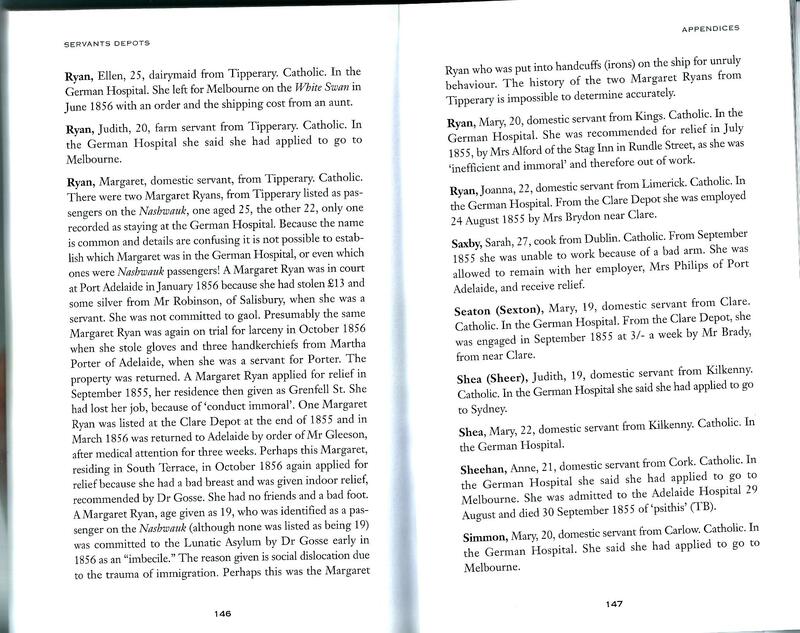 Bridget died named as Mary Ann WEINERT 02.08.1919, age 85 yrs, buried Lobethal cemetery, 75 years in the colony, (should be 65 years), age 18 at marriage, 5 females living, 3 males living, 1 female dead, 1 male dead, cause of death Influenza and sanility. 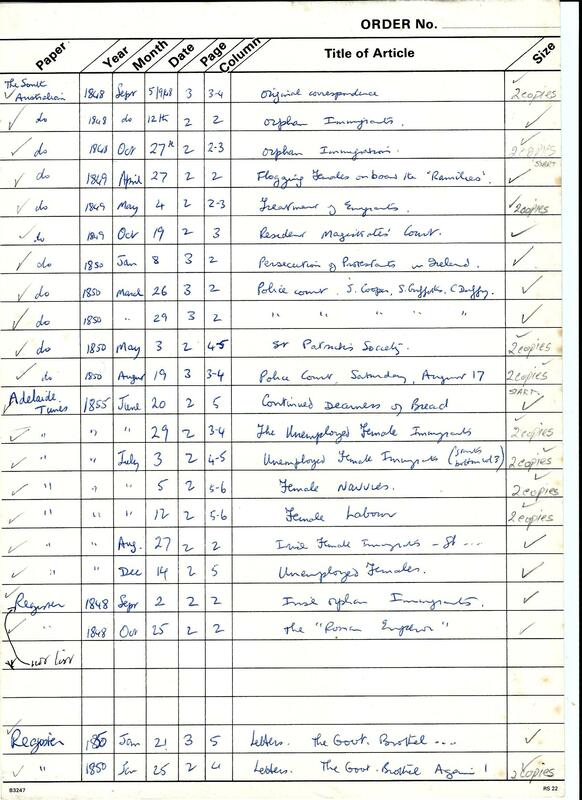 Bridget COLLETON/WEINERT was not a witness at the wedding of Anne WILLIAMS (father Michael) aged 21, house servant) to Conrad Diedrich ENGELKING aged 27, farmer on the 11th of March 1858, at the Anglican Church Balhannah. However her sister-in-law Johanne Pauline WEINERT (recorded as Pauline WEINERT, occupation housekeeper) with a farmer with the initials F.D were present. Anne nee WILLIAMS/ ENGELKING died on the 22nd of February 1870, aged 36yrs 9 months. Cause of death: diaphragmatic paralysis. 15 years 5 months in the colony. Conrad Diedrich ENGELKING was a brewer at Lobethal and died on the 4th of October 1883 aged 52. Cause of death: dropsy, also known as edema. Their daughter Maria Henrietta ENGELKING died on the 20th of January 1864 aged 4. Cause of death: Scarlatina or Scarlet Fever. I assume that Bridget and Anne were at the Mount Barker depot but I haven’t been able to find any information to prove this. They both married prominent German men from Lobethal and resided there. Why was Bridget known as Mary Ann instead of Bridget??? I would like to know where the two girls came from in Kilkenny and I have had no success in finding any information. Thirteen girls from Kilkenny sailed on the ”Confiance’ to Adelaide. Clues needed please. I can forward a photo of Bridgit. Trevor, TT would love to link with this blog, so if you could write a para of intro, that would be grand. If not, we could have a go and get back to you. Next drop us Sunday. Be great to meet it!